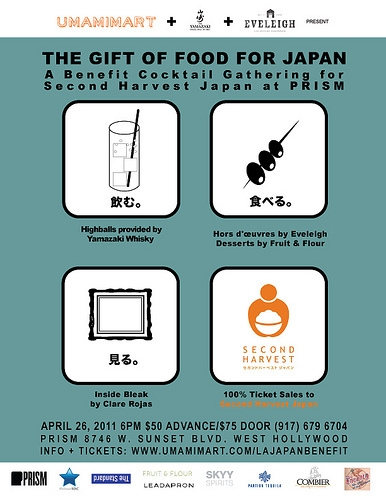 On Tuesday, April 26th, Umamimart, Yamazaki Whisky and Eveleigh present The Gift of Food for Japan, a benefit for the Tokyo-based Second Harvest Japan, the country’s first food bank. In the wake of the recent disasters, Second Harvest Japan has been delivering truckloads of food, water and vital necessities into northern Japan on a daily basis. With over 220,000 survivors still in emergency housing, Second Harvest Japan is currently in Phase Two of its relief efforts, aiming to set up soup kitchens and food banks as affected residents begin to transition into long-term housing and children prepare for the new school year. 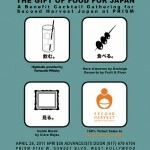 The Gift of Food for Japan starts at 6pm with an intimate rooftop cocktail gathering at PRISM gallery, hosted by Yamazaki and featuring Yamazaki highballs, bites by Eveleigh, and desserts by Fruit & Flour. At 9pm, the party heads next door to Eveleigh, where guests will enjoy a back patio reception featuring a hosted bar donated by SKYY, Partida Tequila, and Combier. From 10pm onward, the patio bar opens to the public for a cash bar, with all proceeds going directly to support Second Harvest Japan. Exclusive limited edition posters and t-shirts designed by artist Clare Rojas (her solo exhibition Inside Bleak is currently at PRISM) will be available for additional donations. Tickets to the event are available in limited quantities for $50 in advance, and $75 the day of the event. All donations are made directly to Second Harvest Japan, and receipts will be issued immediately via email. Two weeks ago, a similar benefit in San Francisco raised over $10,000. Organizers hope to raise $20,000 on Tuesday night in Los Angeles. 100% of ticket sales and donations will go to Second Harvest Japan to support its earthquake and tsunami relief efforts.